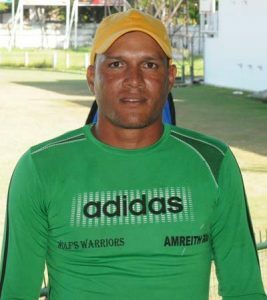 late Wolf’s Warriors Captain Amrit Rai. Rai passed away at the Georgetown Public Hospital Corporation (GPHC) while receiving treatment following an incident that took place on Saturday night last at Met-en-Meer Zorg, West Coast Demerara. According to newspaper information, the incident took place following a dispute at an entertainment activity at Tarla Dam. Rai was among those attending to Premnauth Basdeo who was chopped on the head by an ex-policeman. Following the chopping, the ex-policeman drove his mini bus into the crowd hitting Rai and several others who were rendering assistance. A release from the GSCL Inc stated that Rai was one of the country’s best softball players and will surely be missed. “We are deeply saddened at the tragic demise of one of our top players; his name will go surely down in the record books as one of finest batsmen of his era. The Softball fraternity is in deep shock and this will be hard to overcome especially by those who followed him closely,” the release stated. Rai led Wolf’s Warriors to several major softball titles and was one of the finest Captains in the sport. He was a calm individual who always encourages his players to do their best. Rai last major tournament was the inaugural Prime Minister Cup that was held in October where he represented SCV All Stars of New York.